Nolina nelsonii growing herbaceous succulent of the genus Nolina nelsonii also known as Nelson’s Bear Grass, Nolina nelsonii perennial evergreen plant, used as ornamental drought tolerant plant, can grow in desert, mediterranean, subtropical or temperate climate in hardiness zone 8-12. 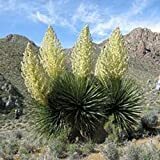 Nolina nelsonii Blue Bear Grass Hardy Exotic Seeds! Plentree Nolina Nelsonii Blue Bear Grass Hardy Exotic Seeds!